Aluminum with baked on enamel glossy finish guaranteed never to rust. Lightweight and rigid. Custom Rider Design available. Please enquire. JUST LIKE HAVING AN INTERACTIVE WEB KIOSK RIGHT THERE ON YOUR LISTING SIGN! Made from 0.40 Aluminum (as thick as a dime) with a powder coated finish and clear coated for extra durability. Guaranteed for 5 years against rusting, chalking or breaking. Our QR CodeRider sign has easy to follow directions for downloading the scanner application. Each sign includes a simple short URL for directly viewing the Mobile Listing page in the phones browser without needing to scan the code. 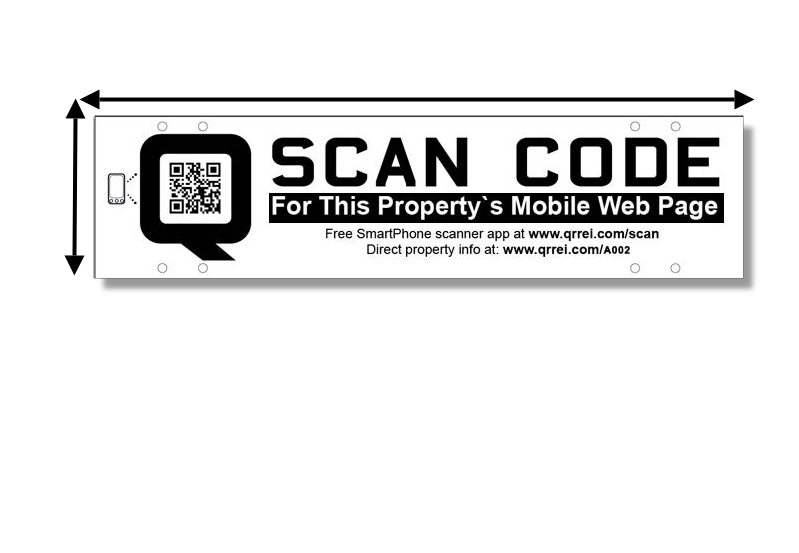 Using our system you can re-use the QRREI code for multiple listings. Sell the property and move the sign, we link the Code and its Rider to the new listing. Now you can make your own OPEN HOUSE signs using the code and know they can be used over and over.